Tim, this is very touching about you. Joni got those Hejira skates from somewhere all those years ago, of course! For me in the UK who just didn't know anyone else into Joni's music until the arrival of the internet and this wonderful site, it's nice to know these things were going on. I feel more connected, like another piece of a jig-saw. Thanks! 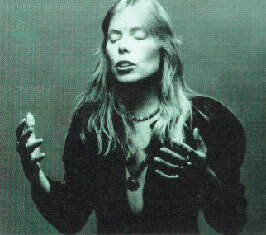 Joni Mitchell wrote perfect songs that zeroed in on my humanity like a laser beam. I was a 20 year old, selfish, self-centered, narcissistic, drug addled alcoholic, so it was perfectly natural to imagine that she was writing her songs just for me. I ached and wept and laughed with every line. I still do. I was second row center at the County Coliseum that night, and seeing her so close, hearing her perfect replication of the songs I'd heard so often on scratchy vinyl was easily the most profound experience of my childish life. Of course, some years later I would win two Nobel Prizes in the same year; one for alcoholism and one for sheer stupidity, and while that, too, was a pretty profound moment, it still didn't measure up to that cold, wet February night with the lovely Ms. Mitchell, very much alive in Madison Wisconsin. The next day I was at my job at Petrie's Sporting Goods on State Street in downtown Madison. I was all alone in the store and I imagine I was earnestly savaging the melody to "Cactus Tree" or some such when a Limo pulled up to the curb. Three people got out and entered the store. The two pushy ones up front blocked my view of the third as they strode to the counter. "We'd like to look at ice skates," they blustered. But the measured voice from behind them said, "Actually, I'd like to look at some ice skates. Do you have figure skates?" I knew who that was. "Hi, Joni, yes we do, they're in the back". It was clearly the most intelligent response to a question from Joni Mitchell I'd ever made in my entire life. And I felt pretty gosh darn good about it. We talked for a while as she tried on a few pair skates. Later that year she'd be going back to Canada to learn how to skate for real from her friend, Toller Cranston, who had won the bronze medal for skating at the most recent Olympics. Meanwhile, she was wondering if there was a place around Madison where she could skate for a while and maybe take some photos. One of my returning associates suggested she try the ice off Willow beach on Lake Mendota, and she said she would. She paid for her skates and left, and aside from the limo and her two somewhat over-protective friends, it was a transaction like any other. It wasn't until many months later when I plunked down hard earned drug money for the Hejira album that I realized the significance of that morning visit. Because there, on the back cover, was a resplendent Joni doing a lovely pirouette, in my ice skates on Lake Mendota! So, in a very real "six degrees of separation kind of way", I have been immortalized in Rock N' Roll culture and lore, right? Joni and I will forever be linked by the fond memories we share of those precious moments in the back room of the little sporting goods store in Madison Wisconsin. I like to think of it as an exact microcosm of the whole "Joan Baez, Bob Dylan" thing, if Bob Dylan had ever sold ice skates to Joan Baez. I'm sure Joni thinks of that twenty minute experience in much the same way. But I have to say, I really appreciate this unique forum. I've really enjoyed writing this memory down and I want to thank Joni for sharing herself with her fans in such a poignant and personal way for all these years. She risked a lot by letting us get to know her, and the world is a better place for it.